The new way of staying ! 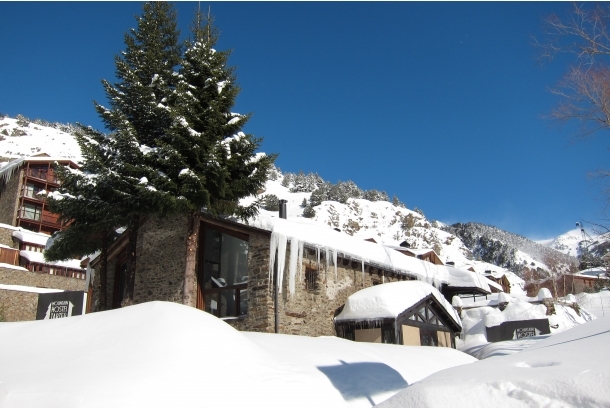 On one of my trips to Andorra I visit the Mountain Hostal Tarter in el Tarter next to Granvalira. It is an old discotheque and is completely reformed into a Hostel. They have a new concept which makes it possible to stay in the mountains for a very reasonable price. There is a big professional kitchen where more people can prepare their dinner at the same time. There are big tables where everybody can sit together next to a huge open fire. You share the bedrooms with your own friends or other people when are alone or just the two of you. The bad room is very big with all separated showers and toilets and it looks really luxury. After been showing around I have to say that I really doubt who have more fun, the people in a very luxury chalet or the people in this nice Hostal. You can book only for yourself or for a group up to 41 people from € 17 a night. Have a look and judge yourself.